CERN congratulates the two laureates of the 2015 Physics Nobel Prize(link is external): Takaaki Kajita, from the Super-Kamiokande Collaboration in Japan, and Arthur B. McDonald, from the Sudbury Neutrino Observatory (SNO) in Canada. They were awarded the prize for: “the discovery of neutrino oscillations, which shows that neutrinos have mass”. The two experiments independently demonstrated that neutrinos can change or “oscillate” from one type to another. This discovery at the turn of the millennium, more than 40 years after the prediction of the phenomenon by Italian physicist Bruno Pontecorvo, has had a profound impact on our understanding of the Universe. There are three types of neutrino in nature: the electron neutrino, the muon neutrino and the tau neutrino. But neutrinos are the chameleons of the particle world: they can change from one type into another. This phenomenon, called “oscillation”, occurs as neutrinos travel long distances. The detection of neutrinos is a challenging task since they interact only very weakly, and therefore interact rarely with matter. The Kamioka observatory, home to the Super-Kamiokande experiment(link is external) is a pioneering laboratory for neutrino physics, It was established in the 1980s as a nucleon decay experiment, hence Kamioka – nde, and has gone on to be a world leading neutrino observatory, securing a Nobel Prize for Masatoshi Koshiba in 2002 for the observation of cosmic neutrinos. 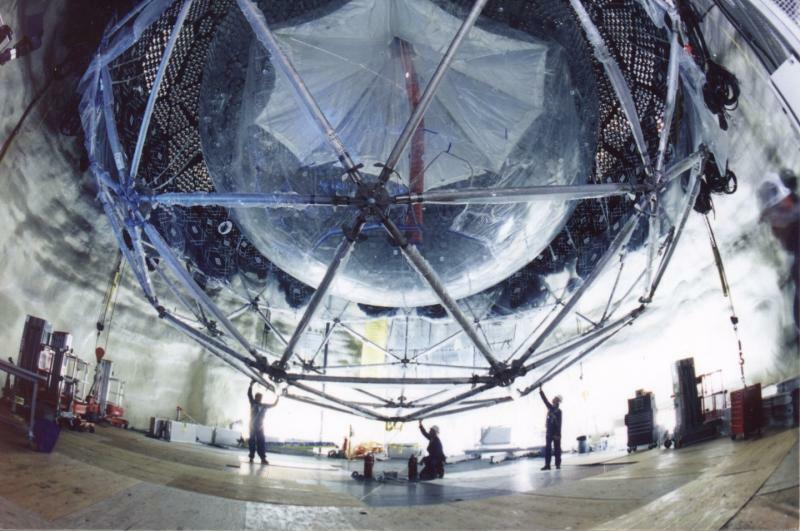 The Sudbury Neutrino Observatory(link is external) is a relative newcomer, beginning its research programme in 1999 with a campaign to measure the oscillation of neutrinos coming from the sun. SNO(link is external) published conclusive results in 2001, which added to and complemented a 1998 Super-Kamiokande measurement showing oscillations of neutrinos generated in the Earth’s atmosphere. 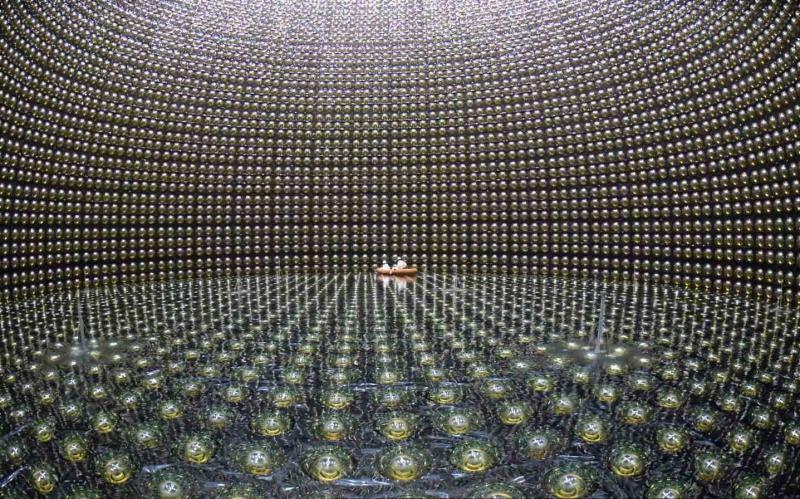 The discovery of neutrino oscillation has significant consequences for our understanding of nature, from the infinitesimally small to the infinitely large. The oscillation process is directly related to the neutrinos’ mass: oscillation is only possible if neutrinos have a mass, however small. Since neutrinos are abundant and ubiquitous, however, even the tiniest neutrino mass has major consequences for the Universe as a whole. Underground laboratories like Kamioka and SNO are prime sites for neutrino physics, but accelerator laboratories can also contribute. CERN has a long tradition of using neutrino beams to probe the Standard Model of particles and forces. In 1973, studying a neutrino beam with Gargamelle detector at CERN, researchers found evidence for the weak neutral current, a phenomenon that shows that the weak force and the electromagnetic force are different manifestations of a single force that we now call electroweak. In the late seventies, two new experiments, CDHS and CHARM, studied a beam from the SPS accelerator to probe the internal structure of protons and neutrons, study the Standard Model and also unveil some of the secrets of the elusive neutrinos themselves. In the 90s, results from the Large Electron Positron collider, installed in the tunnel that now houses theLarge Hadron Collider, showed that there are three and only three types of light neutrinos. And from 2006-2012, CERN sent a neutrino beam to the INFN’s Gran Sasso National Laboratory(link is external) 732 kilometres away in Italy, allowing researchers there to contribute to understanding neutrino oscillation by observing the appearance of tau particles in a pure muon-neutrino beam. Nearly 90 years after their prediction by Wolfgang Pauli and almost 60 years after their experimental discovery, neutrinos remain the most mysterious particles known to nature, and they are subject to a vigorous experimental programme around the world. As part of the European Strategy for Particle Physics [PDF], CERN inaugurated a new facility at the end of 2014. The CERN neutrino platform provides a focal point for Europe’s contribution to global neutrino research, developing and prototyping the next generation of neutrino detectors. In December 2014, the CERN neutrino platform took delivery of theICARUS detector, shipped from the Gran Sasso National Laboratory where it studied the neutrino beam from CERN until 2012. The 760 tonne detector is now being refurbished at CERN, and in 2017, it will be shipped to Fermilab(link is external) in the US in order to become part of a dedicated neutrino programme there. Scientists from the CERN neutrino platform are also involved in R&D for experiments at Fermilab’s Long-Baseline Neutrino Facility(link is external). This entry was posted in High Energy Physics and tagged Nobel. Bookmark the permalink.